Although not as popular for flea markets as some New England cities, Washington, D.C., and the surrounding area does offer some fantastic opportunities to browse for bargains. Most of the flea markets in Washington, Northern Virginia, and Maryland are open year-round and feature a collection of antiques, collectibles, vintage items, clothing, and crafts at discount prices. Some are open every day of the week, but others are only open on the weekends or certain days of the month. Whether you're looking to pick up a good deal or hoping to find a rare artifact among hundreds of vendor stands, you can enjoy a short day trip in the Capital Region to one of these flea markets. The Hardy Middle School in Washington, D.C. hosts the Georgetown Flea Market on Sunday year-round. Known as the area's largest flea market, the Georgetown market offers a wide range of antiques, collectibles, hand-crafted art and jewelry, and vintage furnishings and clothing. The Georgetown Flea Market first opened in 1972, and local resident Larry McMurtry based his book "Cadillac Jack" on this market. All vendors accept cash, but some accept other forms of payment including credit card and PayPal. 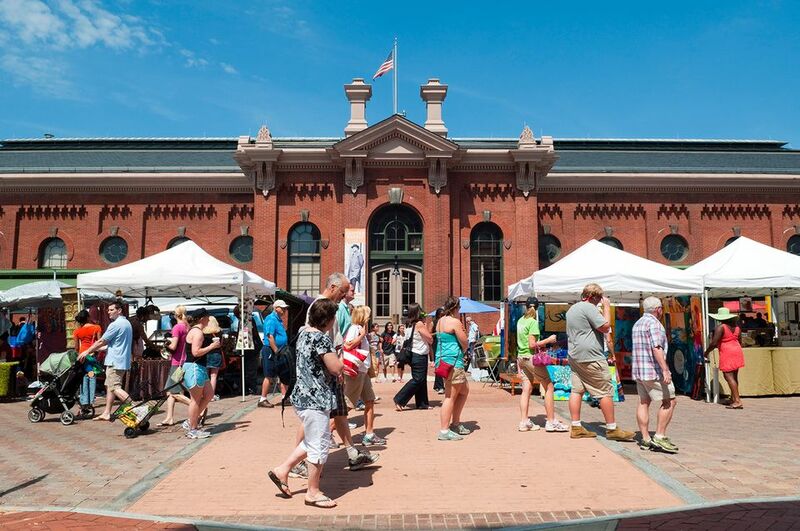 Although it's not the city's biggest market, Eastern Market was rated the second best flea market in the world (for the diversity of vendors) in a Huffington Post poll. First opened in 1983, this market features imports from all around the world including hand-crafted jewelry and art, collectibles, old-world antiques and vintage items. Located just north of Washington in Bethesda, the Montgomery Farm Women's Cooperative Market hosts a flea and farmer's market offering home furnishings, jewelry, arts and crafts, and fresh local produce on Sundays from 8 a.m. to 4 p.m. The Bethesda Flea Market welcomes all vendors to come and set up their own tables in the parking lot of the Market Building for Sunday's event. Additionally, the farmer's market is open on Wednesdays, Fridays, and Saturdays from 7 a.m. to 4 p.m. Located at the ​Montgomery County Fairgrounds in Gaithersburg, Maryland, every Saturday and Sunday year-round, this market offers everything from electronics to new and used items but cannot sell weapons, tobacco products, counterfeit merchandise or live animals. Vendors can set up their own tents and tables for a small vendor fee (which grants a 20-foot space), which means you're likely to find a diverse mix of different items and new stands each time you go. The Arlington Civitan Open Air Market only happens on the first Saturday of each month from April through November each year, but you can find some of the best deals in the region at this popular event in Arlington, Virginia. The Market takes place at the Washington Lee High School and offers a variety of goods ranging from books, clothes, furniture, garden tools, household goods, jewelry, shoes, toys, and records. In 2018, the first market will take place on April 8, since Easter Sunday falls on April 1 this year. 13 Vintage Clothing Stores and Second-Hand Shops in Washington, D.C.